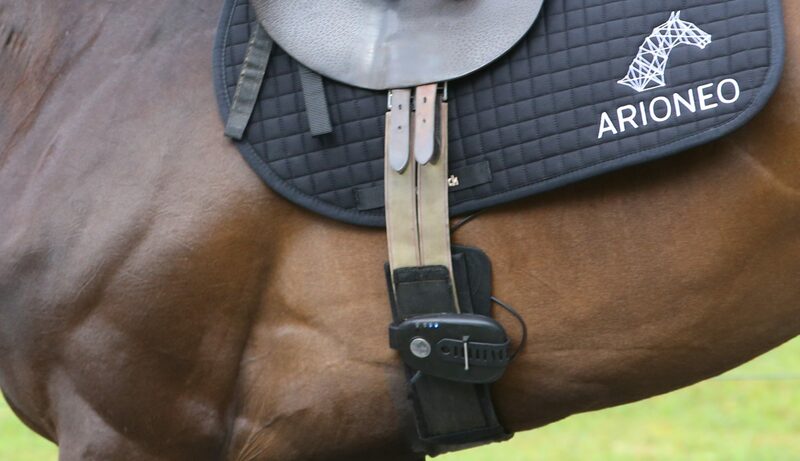 Specially designed to analyse racehorses performance on a daily basis, EQUIMETRE is a connected sensor which is attached to the girth in seconds. It monitors physical and vitals parameters using GPS data, accurate heart rate monitoring and performance indicators. Via the EQUIMETRE platform, the data registered by the sensor are interpreted in order to display the results and parameters of the training in the clearest possible way for trainers. Thanks to the reliability of our interpretation algorithms scientifically validated, the EQUIMETRE platform allows an analyse and a detailed monitoring along some time of the evolution of horses performances thanks to precise and objective data. Each training session that is monitored by EQUIMETRE is shown on the training pages of the online web platform as well as the mobile App. Each individual training page provides the trainer the insight into the preparation and performance of each horse. The objective data provides insight into specific detail that cannot be captured by the eye, providing a trainer with additional information. When used in conjunction with the skill and experience of a trainer, this information can provide vital insight. 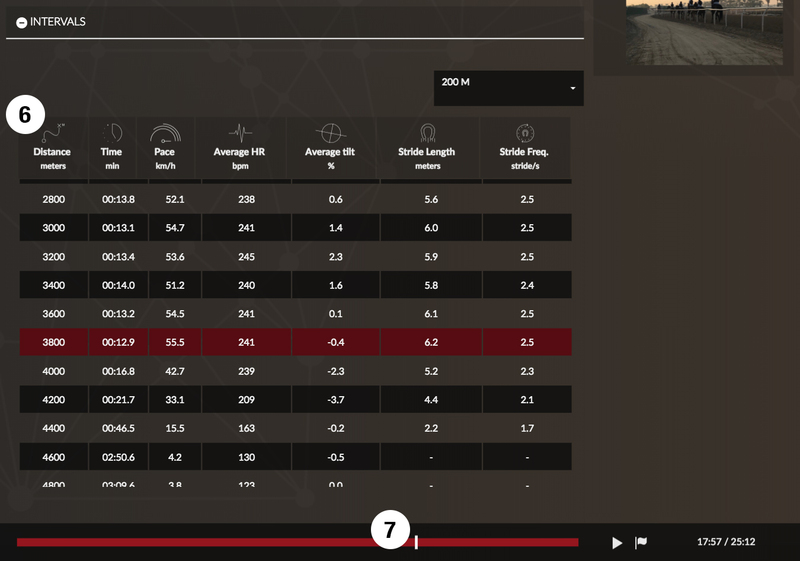 A trainer can now analyse in more detail the performance of each horse in his yard, comparing several horses over the same exercise or by focusing on the progress of each horse individually. The training pages are web pages dedicated to one training in particular, from data collected by EQUIMETRE sensor and structured into 4 distinct areas. 1 – First, the global recap of the training displays the key data. 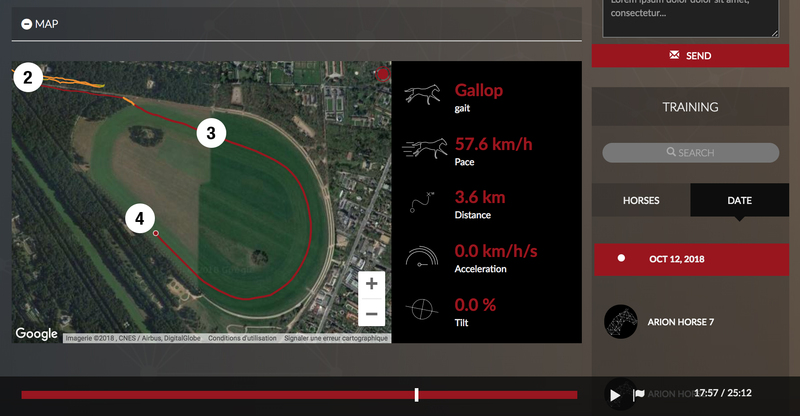 At a glance it allows visualisation of a horse’s performance during exercise, indicting the duration of the training, the maximum speed achieved, highest heart rate and the distance covered as well as the recuperation time after the most intense effort, in other words how quick recovery time was. 2 – A colour coded training map, allows to see the entirety of the training session. The aim here is to provide the trainer with the ability to re-run a specific part or all of the training, one of the gallops for example. By providing this level of detail, a trainer has the complete picture of a training session. It allows analysis of one or all stages of the training with even greater insight into the horse’s performance and how he worked. 3 – A colour represents each gait: yellow for walk, orange for trot and red for gallop. 4 – A point representing the horse moves on the map and in the key data displayed in the box on the right, showing what happened during the training session. 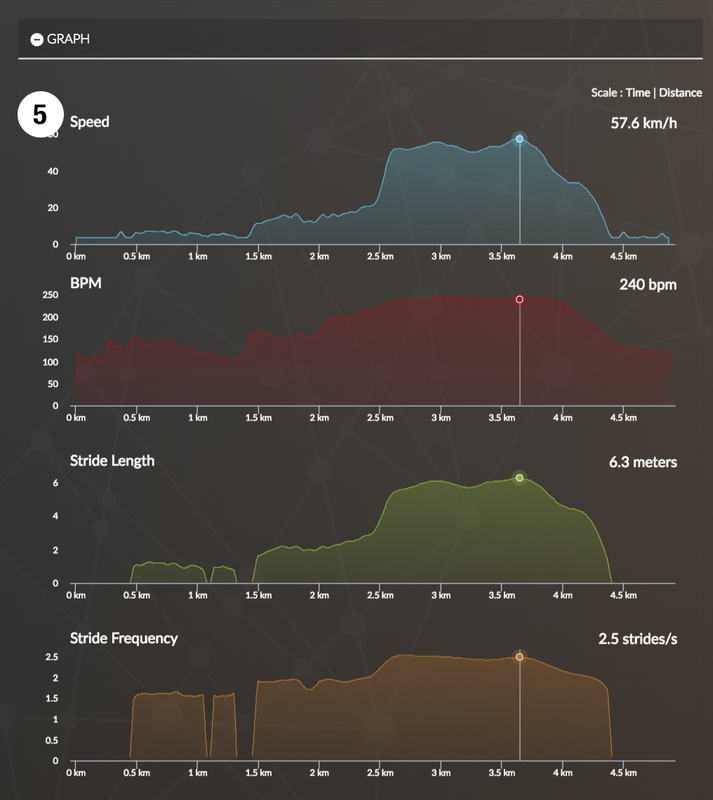 5 – A combination of four graphs provides easy visualisation of the speed, heart rate, stride length and stride frequency data* registered all along the training. The first graph provides insight to the absolute speed of the horse during training. With the second graph, you see the heart rate as the horse exits its box, the increase in heart rate during each phase of exercise, visualisation of the stabilisation of the heart rate after work, analysis of the recovery time along with the heart rate on cool down as the horse returns to the yard. The two movement indicators provide the ability to see the physical capacity of the horse during each session, measuring stride length and the stride frequency during each canter/gallop. *The stride length and stride frequency are monitored only when trotting and galloping. When a horse is walking, this is not monitored and therefore there will be some gaps in the graphs. The split times are shown in a table providing another way to interpret the exercise, segmenting each section of the work, thus allowing a more complete analysis. Providing the trainer with the ability to change distances, each measured interval, allows study of the time and speed averages over the chosen distance, acceleration of the horse, maximum speed as well as heart rate and performance. The analysis of this data ensures a precise view of the regularity, performance and capacity of the horse. A timeline is provided at the bottom of the screen. By clicking directly on a precise point of this timeline, you are able to chose an exact moment in a horse’s training, for example, the peak of the effort and see the exact parameters at that point. Each block is linked to this timeline and represents the physical and physiological data of a horse at a precise moment of the training. Everything is linked from the GPS point on the map, the cursors on the graphs and the highlighted lines on the split times table. 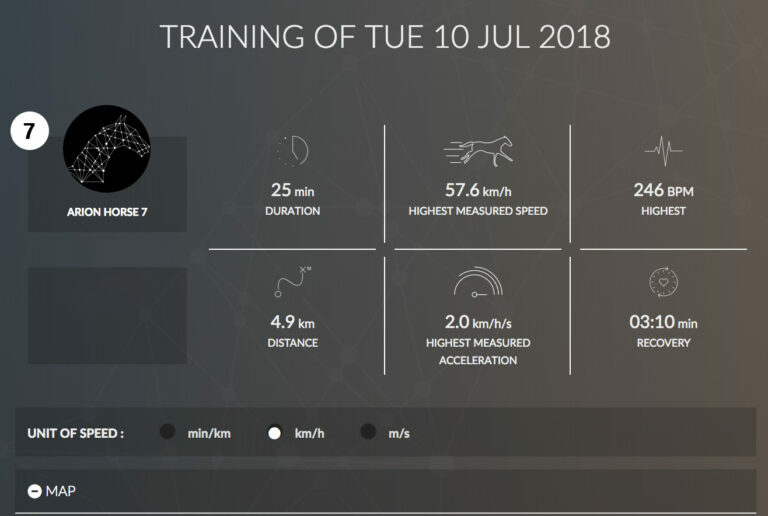 Each training session captured by the EQUIMETRE sensor and synchronised to the analysis platform corresponds to an individual training page. Once on the platform, the storage of each training is available on the trainer account. There is no limit in time, providing the full history of each horse over time that has been monitored by EQUIMETRE. 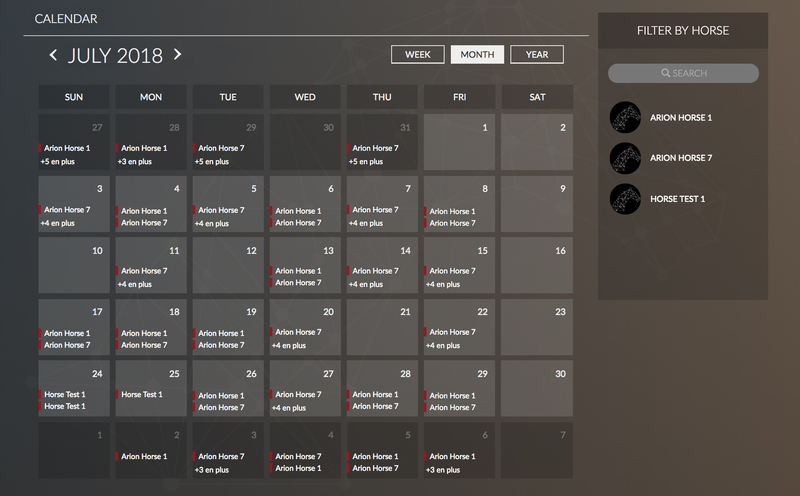 This allows a trainer to revisit training sessions weeks, months or even years later. Our next article will be devoted to the comparing horses and monitoring the progress of one horse’s performance over time. The comfort zone is the range in which the temperature of the horse is neither too hot nor too cold. Orscana helps you to monitor his thermoregulation. Do you think your horse doesn’t rest overnight? Just changed yards or stable, how is your horse reacting? We all have 101 questions about what our horses do when we aren’t there, Orscana allows you to see what they have been up to.